LETRAN clinched in overtime what it couldn't finish in regultion, holding off San Beda, 85-82, in a Game Three to remember on Thursday to end a decade-long title drought in the NCAA men's basketball tournament. Jomari Sollano proved to be an unlikely hero for Letran, hitting the big basket and free throw that enabled Letran to finally put the game away after wasting an eight-point lead in the final two minutes of regulaton. Sollano's baseline jumper put Letran back on top and the undersized center who had played under the shadows of teammates Mark Cruz and Kevin Racal, added a free throw for an 84-82 lead with six seconds left. "Tama na ang sakit. 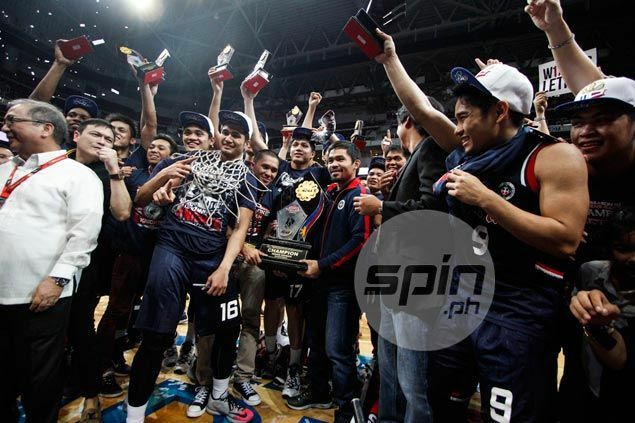 Tayo naman," said Letran coach Aldin Ayo in the din of the celebration after a wild and wooly ballgame witnessed by over 20,000 fans at the Mall of Asia Arena. Ayo won a championship for Letran as a player in 1999 and got his victory ride as a first-year coach as the Letran community celebrated the school's first championship since 2005. Letran lost twice to San Beda in the finals during the Red Lions' five-year reign. By turning the tables this time, the Knights ended the dynasty of San Beda, which made a gallant run in the final two minutes of regulation and was still in the hunt up until the final seconds of the extra period. However, the Red Lions' hopes were crushed by a double-lane violation called by the referees after Sollano missed his second free throw with six seconds left. The possession arrow was with Letran and Cruz added a free throw with 3.7 seconds for an 85-82 Letran lead. Art Dela Cruz's desperation heave missed the mark at the buzzer, triggering a shower of confetti from the MOA Arena catwalk. Racal topscored for Letran with 23 points while Cruz scored most of his 14 points in the second half of a riveting Game Three that kept fans on the edge of their seats. He was later named Finals MVP. The unheralded Sollano added 19 points while helping hold down San Beda giant Ola Adeogun inside the paint, swinging the momentum in the Knights' favor. The Knights appeared to have put the game - and the title - under wraps when back-to-back three-pointers by Racal followed by another trey by Cruz gave them a 75-67 cushion with under two minutes to go. The Red Lions, however, were far from finished, ending regulation with a run of eight unanswered points capped by a Baser Amer layup off a Letran turnover that made it 75-all, time down to 13 seconds.